Cancer of the salivary gland is quite rare, The statistic given by NCI is 2.5 to 3 new casesout of 100,000 population, or about 1,000 new cases per year in the US – according to the National Cancer Institute. The cancer only represents 3 to 5 percent of total head and neck cancers. The cancer begins in the salivary glands in the head, which are located in the mouth, throat and neck. The most common place for the cancer to start is in the parotid gland — near the front part of the ear. Adam “MCA” Yauch, member of the iconic Beastie Boys, has passed away after being diagnosed with cancer of the salivary gland, according to news reports. Yauch, 47, was treated for the cancer in 2009, and in 2011, there were false reports that he had beaten it. But he actually was never cured of the disease. Not all salivary gland tumors are cancerous, according to the National Institutes of Health. When the tumor is benign, a doctor may choose to just remove the salivary gland. However, other treatments like radiation therapy, chemotherapy are needed if the tumor is malignant (surgery to remove the cancerous tumor is also an option), according to the Cleveland Clinic. and facial pain – according to the National Cancer Institute. Tests to diagnose the cancer include screenings like MRI, CT or PET scans, an ultrasound exam and endoscopy. The Cleveland Clinic reported that a number of factors can influence how deadly salivary gland cancer will be, including how old the patient is and how healthy he or she is; what kinds of cancer cells the tumor is comprised of; which salivary gland the cancer is in; and the size of the cancer tumor. There are also many more tiny glands in the lining of the mouth and throat. 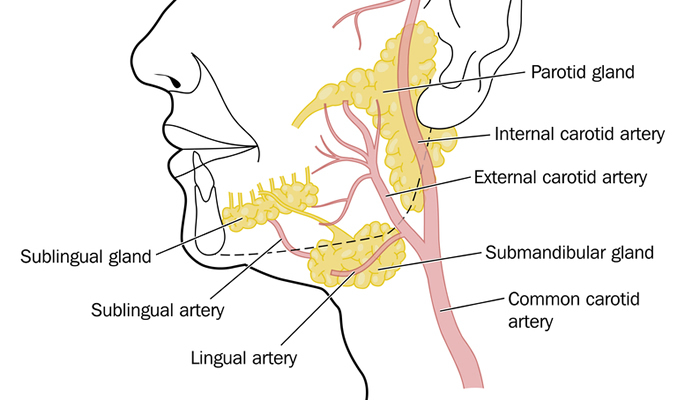 These don’t have individual names but are known as the minor salivary glands and cancers affecting the salivary glands are rare, with approximately 550 new cases in the UK each year. They can occur at any age, but are more common in people over 50. There are different types of salivary gland cancer, depending on the type of cell that has become cancerous. Like many other forms of cancer, the exact causes of salivary gland cancer are unknown. Non-cancerous tumours of the salivary glands are a lot more common than cancerous tumours apparently! Tumours affecting the salivary glands are not infectious and cannot be passed on to other people. They are not caused by an inherited faulty gene, so the relatives of someone with salivary gland cancer won’t be queueing up for a bout of salivary cancer! Things to look out for are a swelling on the side of the face, just in front of the ears, or under the jawbone and some people suffer some numbness and drooping of one side of the face (facial palsy)-abit like having a stroke. These symptoms may occur with different conditions; ie, other than cancer, and most people with these symptoms won’t have a salivary gland cancer-very few do. However, like most cancers, salivary gland cancers are best treated when diagnosed at an early stage. You should tell your GP about these symptoms if they do not improve over a few days.